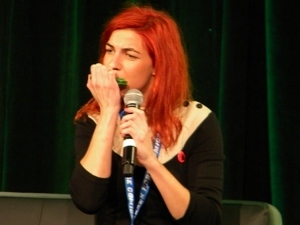 Natalia Tena opened her panel at Emerald City Comicon 2013 with an impromptu harmonica rendition of The Beatles’ “Love Me Do.” It wasn’t the first time the actress’ musical abilities were discussed, as the panel moderator spoke about the band Tena sings and plays accordion in, Molotov Jukebox. 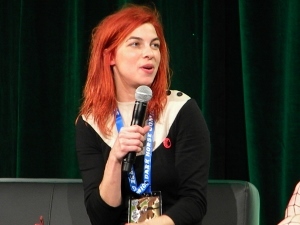 But the fans assembled at the Washington State Convention Center on March 2 were, of course, mostly ready to hear about Tena’s roles as Osha on the HBO series Game of Thrones and Nymphadora Tonks in four Harry Potter films. She didn’t disappoint, gamely answering questions about those projects and more. Regarding whether or not she worried about being typecast based on her roles in fantasy films and television, she seemed unconcerned. 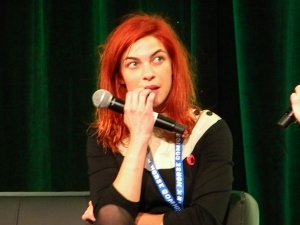 She believes these roles, especially Tonks, were minor enough that people won’t continue to associate her with them. Speaking about her debut role in the 2002 Hugh Grant film About a Boy, she admitted that she never expected it to lead more roles. There was an awkward moment during the hour. When asked a question about Thrones star Peter Dinklage, she didn’t recognize the name. Only after numerous audience members began shouting out “Tyrion” did she understand who was being referenced. She saved a little face by explaining they shoot their respective scenes in entirely different locations, but it was still a little weird she didn’t know the actor’s name. Season three of Game of Thrones premieres March 31. 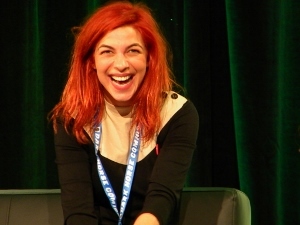 For more information about Natalia Tena’s band, Molotov Jukebox, visit their official website.